Oskar Werner was a quietly handsome actor of both stage and screen who embodied the influence of Europe in American culture during the 1950s, and 60s, starring in both imported films and Hollywood products. There is something odd about Werner. Raised by his grandmother who introduced him to the theatre, Oskar became the youngest person (18) to be accepted to the Vienna State Theatre by director Lothar Müthel, in 1940 (after the Anchluss). 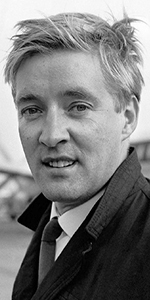 Changing his name to Oskar Werner, he made his debut there in October, 1940. His training was interrupted by his being drafted into the German Wehrmacht in December, 1941. Not a fan of Hitler's National Socialist Party, Oskar appeared to his officers to be an outstanding model of the Aryan race — but he wanted nothing to do with it — he was a pacifist. Oskar purposely acted the fool by falling off his horse and other bungles, until he was drummed out of training school. Instead of fighting on the Eastern Front, Werner was assigned to peeling potatoes and cleaning latrines. Undaunted, in 1944, he married a half Jewish woman Elisabeth Kallina in secret, and fathered a daughter right away. In December of that year, Oskar fled with his wife and daughter to hide in a hut in the Vienna woods as the bombs singalling the U.S. invasion fell. It was harrowing. After the war, Werner returned to act in plays in Vienna. He made his film debut in Der Engel mit der Posaune - The Angel with the Trumpet (released in August, 1948). He also had a part as Beethoven's dissolute nephew Karl in Eroica (released in July, 1949). In 1950, an English producer wanted to re-make The Angel with the Trumpet (released in March, 1950) in English. Werner's english was good enough that he was asked to play his part again in this re-make for director Anthony Bushell. Werner was on hand when director Anatole Litvak led a 20th Century-Fox crew to Germany to film battle scenes for Decision Before Dawn (released in December, 1951). Werner has a significant role in this film, with Fox hoping to make a star out of him. They arranged to have him make his imprints at the Chinese, but a sheduling problem caused Werner to miss his own ceremony! (he was filming a number of projects in Germany). In order to accomplish the imprinting without him actually being there, his co-star in the picture, Hildegrard Knef, was asked to come out and make her imprints, and at the same time, do the honors for Oskar. Plasters casts were made of the actor's hands, a metal die made of his signature, his shoes were brought out, and Ms. Knef imprinted them and signed the date. Roles in Hollywood were not forthcoming from the Fox studio, so, newly divorced, Werner moved to Liechtenstein, designing and building a large residence there. Oskar returned to the stage, performing in Hamlet, Henry IV, Henry V, and Becket in various German theatres. In 1954, he married Tyrone Power's step-daughter, Anna, who encouraged Osker to return to films. And return he did. Four films released in one year — Der Letzte Akt - The Last Ten Days (released in April, 1955), directed by G. W. Pabst, Spionage (released in April, 1955), he played the title role (!) in Mozart - The Life and Loves of Mozart (released in December, 1955), and Lola Montès (released in December, 1955) for director Max Ophuls. Werner had the good fortune to be asked by French director Françcois Truffaut to co-star in Jules et Jim - Jules and Jim (released in January, 1962). The breezy story of two men who share a lover caught the 1960s vibe instantly, with Werner becoming an international star. American director Stanley Kramer had Werner come to Hollywood and take a role as a ship's doctor in his adaptation of Ship of Fools (released in July, 1965). Next Werner was to appear as an East German Jewish spy for director Martin Ritt in his adaptation of The Spy Who Came in from the Cold (released in December, 1965. In 1966, Werner re-teamed with François Truffaut for Fahrenheit 451 (released in September, 1966). Werner's stoney softness was perfect for his role as a book-burning fireman who begins to question his profession. It is perhaps Oskar Werner's most iconic role. He played an equally ambivalent preist in Shoes of the Fisherman (released in November, 1968) with Anthony Quinn. Having divorced Power in 1968, Werner toured Europe and Isreal by doing plays. Strangely, he took a guest-starring role on Columbo in 1975, and made his final film, Voyage of the Damned (released in December, 1976). He starred in a 1983 stage production of Der Prinz von Homburg - The Prince of Homburg. With Alcoholism a strong factor in his declining health, Werner was found dead of a heart attack in his hotel room in Marburg, Germany. He was only 61.